Whatever your application, intelligent power control optimizes electricity use and ensures smooth control of equipment. Accurate and fast feedback can help manage the abrupt increase in current flow that occurs when a machine tool starts working on a part, for example. For electrical motors with variable speed drives, fine current control in varying operating temperatures improves speed and torque control and can also provide energy savings of up to 30% or more. The problem of excessive torque ripple in synchronous motors has been a constant source of frustration for engineers. Historically, it has been difficult to maintain consistent current measurement gain across the three phases of a motor drive due to accuracy variations among traditional current measurement sensors. LEM’s new LF xx10 current transducer series now offers extremely high measurement accuracy across the whole operating temperature range. Torque ripple is dramatically reduced when the accuracy variation is minimized, which allows for a more comfortable ride for elevators, trains or other transport applications, and increases precision for machine tools, robots and other automation applications. New Energy-related Productt (ErP) directives for electrical motors in the EU are driving the need for energy savings: IE2 standards were imposed in 2011 and IE3 in 2015, with motors up to 7.5kW having until 2017 to comply. The most cost-effective solution for reaching these standards are high-performance drive controllers with high current measurement accuracy such as that offered by the LF xx10 series. As products are designed with smaller form-factors, space is at an absolute premium, something evident in technologies like machine room-less elevators where most of the components must fit within the shaft containing the elevator car. 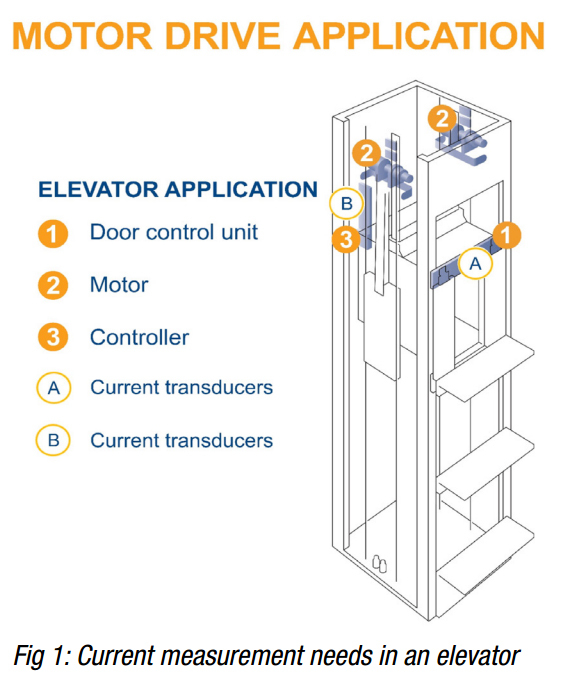 A small cabinet houses the elevator controller and the motors, as well as the inverter. 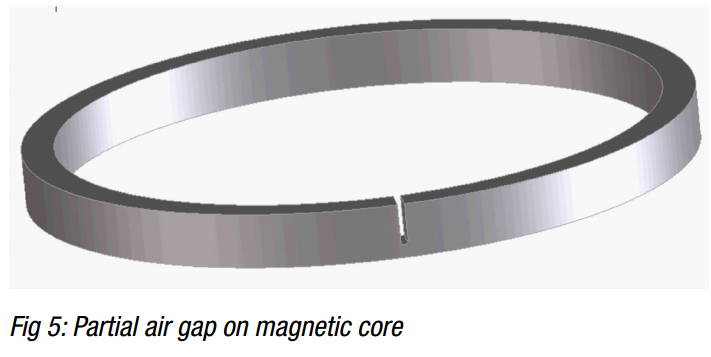 To guard against unexpected behavior, components must be rated to work in close proximity to each other, and the current transducers must be immune to any magnetic fields generated by other components. The position of the elevator must be perfect, independent of the weight in the elevator car or the operating temperature, in order to avoid any accidents when stepping in and out of the cabin. Accurate current measurement ensures that the motors are powered with the correct amount of current, whatever the environment and operating temperature (Figure 1). Other applications, such as onshore and offshore wind turbines, face constraints due to limited space and the resulting component proximity. The stability of the current measurement on the grid side, regardless of temperature, is key when the electricity produced needs to be fed into and controlled within the power grid. While the basic wind power application has not changed over the last 20 years, the adoption of permanent magnet generators and an increase in turbine size are raising the demands on current sensors. The design of the new LF xx10 series makes these sensors well-suited to the many challenges presented by today’s larger, more efficient wind turbines. The introduction of higher efficiency Permanent Magnet (PM) generators has led to an increase in current levels. Traditional double-fed generators require a relatively lowpower inverter, where the generator itself is the main power source and the inverter only controls the excitation of the generator and therefore handles only a fraction of the main power. In contrast, inverters for Permanent Magnet generators need to convert the frequency of all the power—several times as much current. The LF series can suit most power needs, offering five rating options from 100A to 2000A. With some offshore turbines already at 6MV, the amount of power produced by larger wind turbines is also creating electromagnetic challenges. This increase is often addressed by splitting an inverter into several parallel modules, where each module encloses several bus bars carrying thousands of amperes and generates strong stray fields. As described in the working principles below, the LF 510 and LF 1010 models are designed around a partial air gap which significantly reduces the impact of external fields, a feature particularly welcomed by engineers working on modular inverters. Finally, as the power generated increases, improvements in sensing accuracy can offer even greater power savings. One example of this is the impact of the offset error, or the output of the transducer when the primary current is 0A, has on the output current of the device. In practice, the offset current may negatively effect the inverter control loop by generating a DC current that dissipates into the transformer where a turbine connects to the grid. Thanks to its Application Specific Integrated Circuit (ASIC) technology, the LF xx10 series achieves an extremely low offset current, and offset drift up to five times lower than the previous generation of LF xx05 transducers. With the new LF xx10 series (Figure 2), LEM brings the performance of a closed loop Hall effect transducer up to the level of a closed loop Fluxgate transducer. 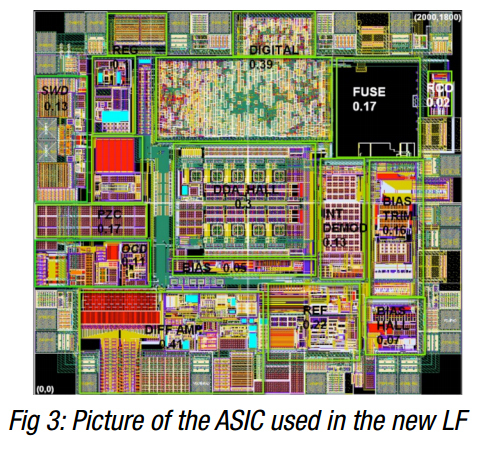 The ASIC Hall chip improves offset and offset drift over temperature dramatically in comparison to previous solutions by using several high performance techniques— some of which were patented by LEM—such as spinning and specialized IC geometry. Using this new ASIC (Figure 3), LEM has designed a complete line of current transducer to cover nominal current measurements from 100 to 2000A: LF 210-S, LF 310-S, LF 510-S, LF 1010-S and LF 2010-S models. The LF xx10 series breaks new ground, delivering up to five times greater global accuracy over the temperature range—from 0.2 to 0.6% of IPN—than the previous generation of closed loop Hall effect current transducers, and a maximum offset drift of just 0.1% of IPN. Thanks to the partial air gap of the magnetic core (Figure 5), the LF 510-S, LF 1010-S and LF 2010 models also have a very low sensitivity to external AC and DC fields which allows for a more compact design. Finally, LF xx10 transducers offer a fast response time, with a typical delay (defined at 90% of IPN) against a current step at IPN of less than 0.5µs. 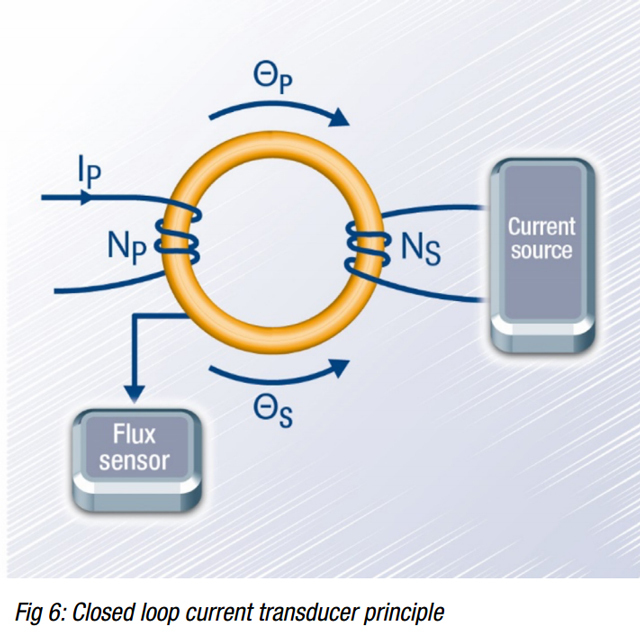 For accurate measurement of DC currents, the technology compensates the current linkage Θp created by the current Ip to be measured by an opposing current linkage Θs created by a current Is flowing through a known number of turns Ns (Figure 6) to obtain: ΘP − ΘS = 0 or NP·IP − NS·IS = 0 with Np the number of primary turns and Ns the number of secondary turns. To achieve accurate compensation of the two opposing current linkages (Θp and Θs), a detector capable of accurately measuring Θ = 0 must be used, which means the detector must be very sensitive to small values of a residual magnetic flux Ѱ (created by the current linkage Θ) to achieve the greatest possible detector output signal. 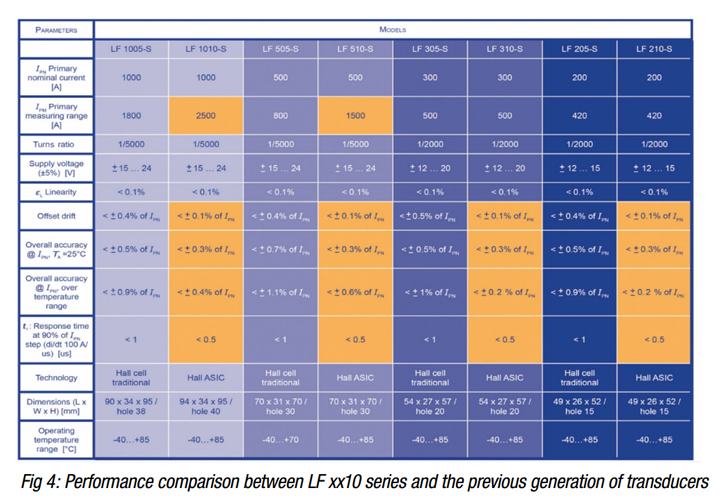 By using this operating principle along with LEM’s patented Hall effect ASIC as the detector, the LF xx10 current transducers meet the high-performance demands of power electronics applications by providing next-level accuracy for nominal current measurements from 100A to 2000A (4000A peak).